The Iconic Alan Bennett’s ‘Talking Heads’. 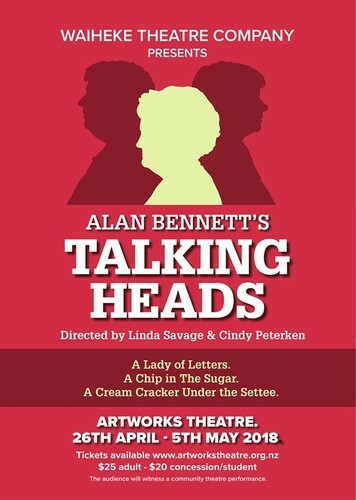 If you want to be emotionally moved and moved to laugh out loud then you must see Waiheke Theatre Company’s upcoming production of Alan Bennett’s ‘Talking Heads’. First staged on BBCTV in April 1988, these darkly comic, tragically poignant and wonderfully uplifting monologues were considered ground-breaking and helped to confirm Bennett’s reputation as one of Britain’s finest modern dramatists. Bennett’s work also includes the wonderful true story of ‘Lady in the van’ and ‘Madness of King George’ which were both nominated for BAFTA awards. Make sure you do not miss three of our local actors performing to their very best and relishing every delicious piece of text. Don’t miss out: with only seven shows you’ll want to book early. Thursday 26 April is the Gala Opening for Talking Heads: Ticket sales are limited for this show so get in quick.